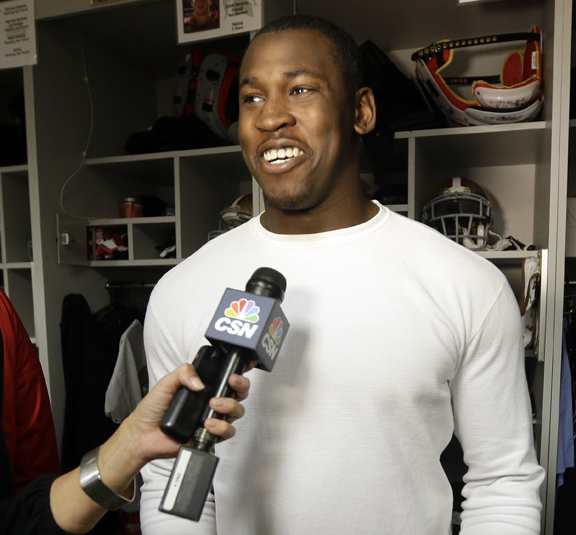 SANTA CLARA, Calif. (AP) — Aldon Smith believes he is on the path to being sober for good. Part of the process for the San Francisco 49ers’ All-Pro linebacker to rejoin the team following a five-week stint in rehab included a verbal commitment to the NFL that he would stay out of trouble and keep clean. A clean-cut Smith — hair trimmed from his previous long, curly cut — returned to the 49ers’ locker room after his long absence and five missed games to cheers from teammates who chanted his first name. Everybody knows what he means to this franchise and defense — and the 49ers are hopeful he is as healthy as he looks and ready to return to the field as soon as Sunday’s home game with Carolina. Smith had been on an indefinite paid leave of absence before being activated to the 53-man roster Thurs­day, two days after he turned himself in to Santa Clara County authorities on weapons charges. He met last Wednesday with team officials. The fearsome pass-rusher is in shape despite a couple of extra pounds gained during his stint at an in-patient treatment center for substance abuse. He was at a facility outside California, he said, while declining to offer further details. He said he returned to the Bay Area on Oct. 28 after entering rehab in late September — and he was away for his 24th birthday Sept. 25. Defensive teammate and fellow linebacker Patrick Willis is among those who sent periodic text messages to Smith during his time away. Smith played in a 27-7 home loss to the Colts on Sept. 22 and had five tackles just two days after he was arrested and jailed on suspicion of DUI and marijuana possession. He apologized for his behavior after the game then later announced he would leave for treatment. San Francisco (6-2) has won five straight games in impressive fashion without him. Also in September, Smith and former teammate Delanie Walker were named in a lawsuit filed in Santa Clara County Superior Court by a Northern California man who said he was shot at a party at Smith’s house on June 29, 2012. Smith, selected seventh overall in the 2011 draft out of Missouri, had previously been arrested on suspicion of DUI in January 2012 in Miami shortly after the 49ers lost in the NFC championship game. Now, Smith is moving forward. He’s thrilled to be reunited with not only his team but also his 10-month-old son, Aulis. While Smith is scheduled for court appearances each of the next two Tuesdays, he expects to be in practice. Smith was charged Oct. 9 with three felony counts of illegal possession of an assault weapon, stemming from that party at his home in June 2012. Smith had a franchise-record 19½ sacks last season for the NFC champions. He has 4½ sacks and 18 tackles over three games in 2013. “I’m just taking it one day at a time, getting back here, being around the guys and just getting my life back at home,” Smith said. Also Tuesday, leading 2012 wideout Michael Crabtree was cleared to resume practicing following May surgery to repair a torn right Achilles tendon. The 49ers now have three weeks to activate him.